See below for submissions related to employment. 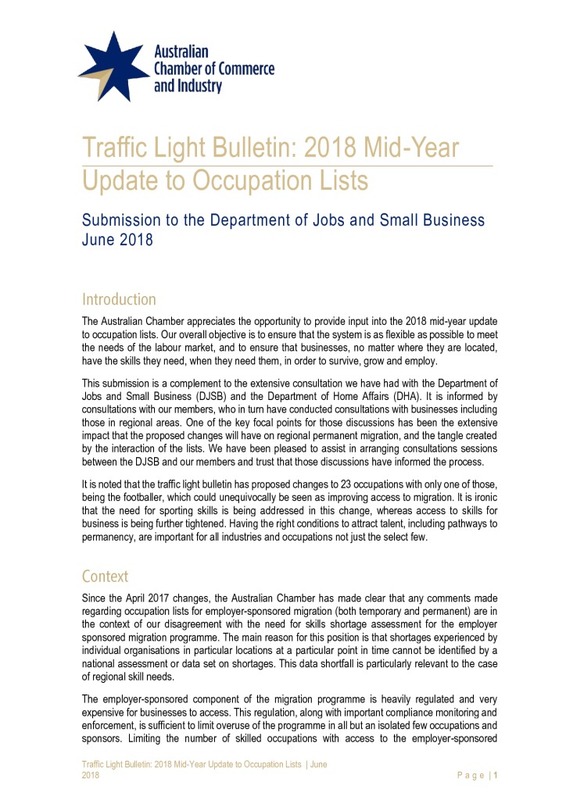 The Australian Chamber submission is a complement to the extensive consultations with the Department of Jobs and Small Business and the Department of Home Affairs. The employer-sponsored component of the migration programme is heavily regulated and very expensive for businesses to access. This regulation, along with important compliance monitoring and enforcement, is sufficient to limit overuse of the programme in all but an isolated few occupations and sponsors. Limiting the number of skilled occupations with access to the employer-sponsored component is a blunt instrument that has denied over the last 12 months many businesses with legitimate skill needs from accessing the workforce they need to be sustainable and grow. The overall objective is to ensure that the migration system is as flexible as possible to meet the needs of the labour market, and to ensure that businesses, no matter where they are located, have the skills they need, when they need them, in order to survive, grow and employ. 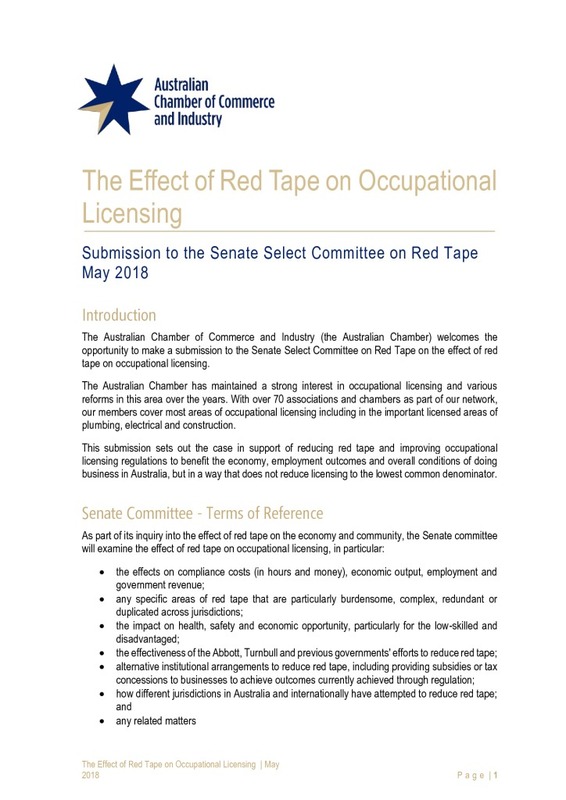 The Australian Chamber of Commerce and Industry welcomes the opportunity to make a submission to the Senate Select Committee on Red Tape on the effect of red tape on occupational licensing. The Australian Chamber has maintained a strong interest in occupational licensing and various reforms in this area over the years. With over 70 associations and chambers as part of our network, our members cover most areas of occupational licensing including in the important licensed areas of plumbing, electrical and construction. This submission sets out the case in support of reducing red tape and improving occupational licensing regulations to benefit the economy, employment outcomes and overall conditions of doing business in Australia, but in a way that does not reduce licensing to the lowest common denominator.